Find out what has been happening on the iLearnRW project below. 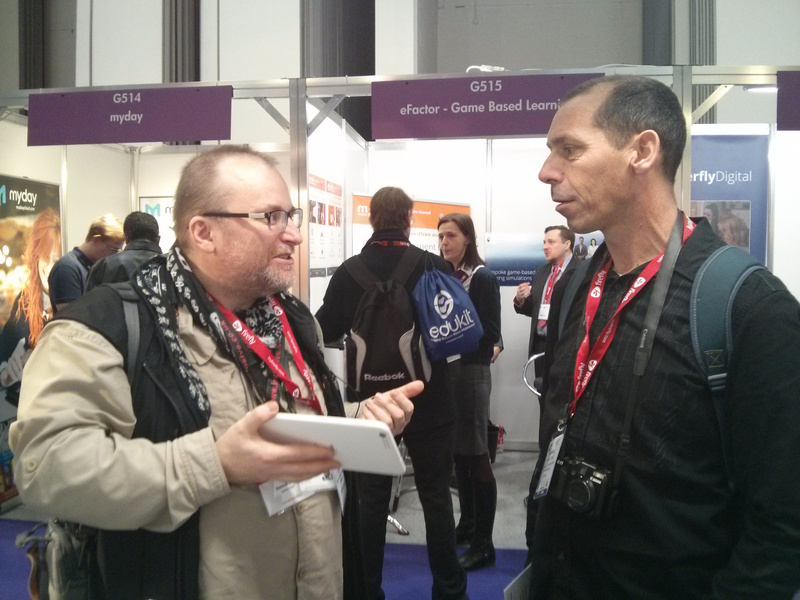 Members of the IoE and Dyslexia Action teams presented the iLearnRW software at BETT 2015, the world’s leading learning technology event which has been running for over 30 years. With over 35,000 attendees, the BETT show was a fantastic venue for sharing our work with teachers and other educational technology specialists. Attendees had the chance to find out more about the iLearnRW project at our exhibit across all 4 days of the show, and were able to try out the software. The IoE Team participated in the LKL@10 Anniversary event at the London Knowledge Lab, which was an event celebrating some of the high-quality research that has been produced over the past ten years at the lab. Professor Richard Noss, the co-director of the LKL, presented a short overview of the wide variety of research projects that members of the lab have been involved in, which included the iLearnRW project, and then Professor Jim Knight (former Minister for Schools) gave the Anniversary lecture. 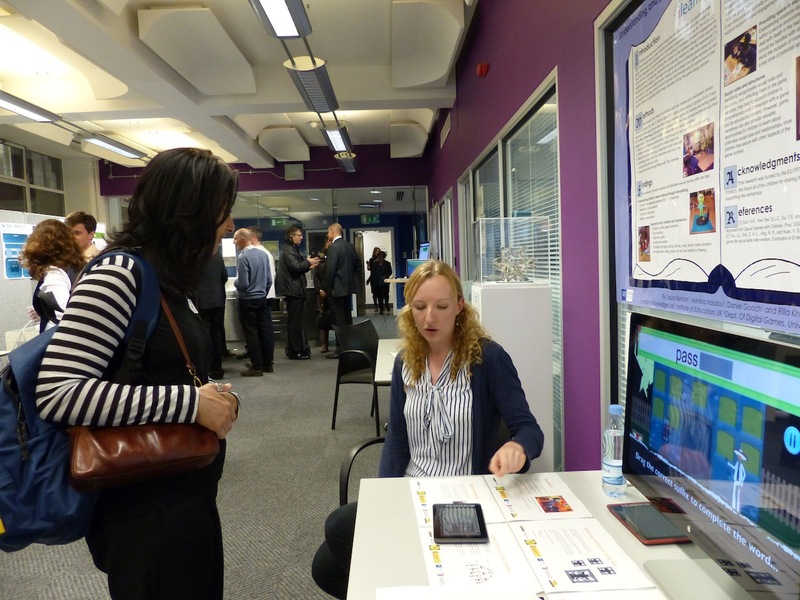 Invited guests also had the chance to find out more about the iLearnRW project at our research display before and after the lecture, and were able to try out the prototype software. 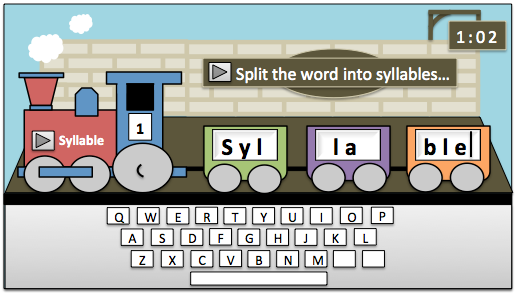 We now have fully functioning prototypes of both the reader and game, and members of the IOE and Dyslexia Action teams have begun trialing the software in several primary schools in London and Rugby. A small subset of children from Year 5 and 6 (ages 9-11 years) at each of these schools have been selected to participate to receive additional help with their literacy through the iLearnRW software and each child has been provided with their own tablet with the Words Matter game and reader installed. The tablets are being used in school by specialist literacy intervention teachers as well as being taken home by some children for further practice. We have already had some positive feedback from schools and we hope that this early pilot will result in further improvements to the software as well as inform the setup for our larger evaluation which will commence in January. 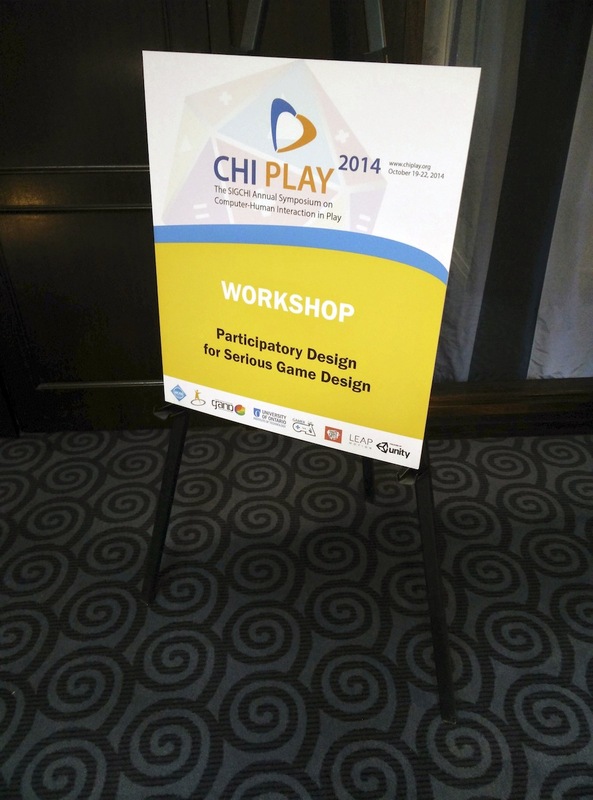 Rilla Khaled (UoM) and Mina Vasalou (IoE) recently co-organised a workshop at the CHI Play conference in Toronto on the topic of Participatory Design for Serious Games. 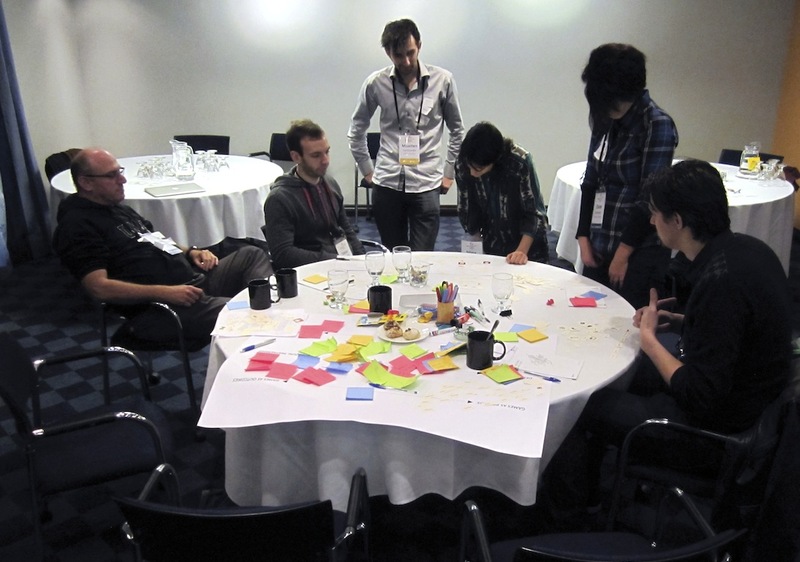 The purpose of the workshop was to gather together the community of designers and researchers working in the shared space of serious games and participatory design, and to begin to understand how they influence one another. 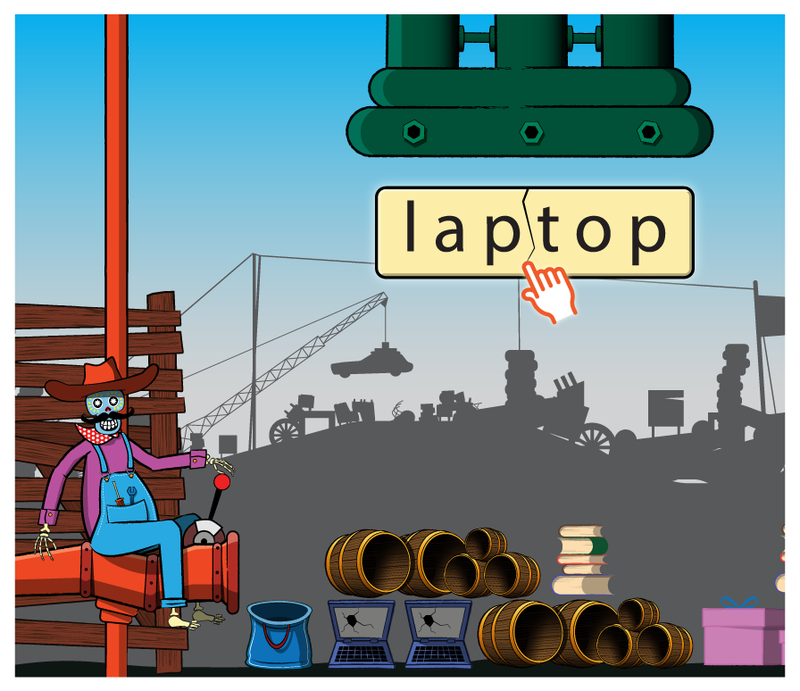 Aspects of the iLearnRW project were shared over the day as an example case study involving domain content experts, technology-focused experts, teachers, children, and designers. From this and other case studies shared, it became clear that many people in this community face similar challenges, and that serious game design makes participatory design more complex. 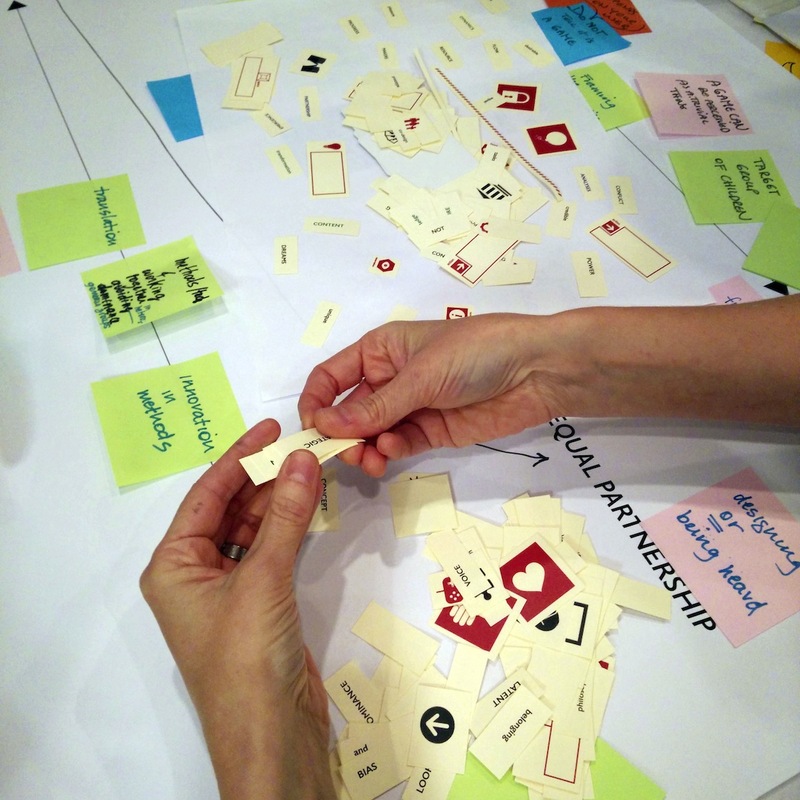 While all participants agreed there is no universal way to carry out participatory serious game design, iLearnRW experiences, alongside those shared by other participants, do shed light on potential approaches that may be useful in specific design contexts. Laura Benton from the IOE Team was invited to give at talk at the Department of Business, Innovation and Skills (BIS) in London as part of their Reliance on Science seminar series, which is a high-profile speaker series for BIS staff and intended to investigate and celebrate the relevance of science, engineering and technology to BIS. Her talk was on technology design and neurodiversity and as part of this she discussed her work on the iLearnRW project and the involvement of users with neurodiverse conditions such as dyslexia in the design of new technology. Two partners from the iLearnRW project participated in the annual European Researchers' Night, a celebration of science and research, which took place on Friday 26th September in several hundred cities across Europe and beyond. 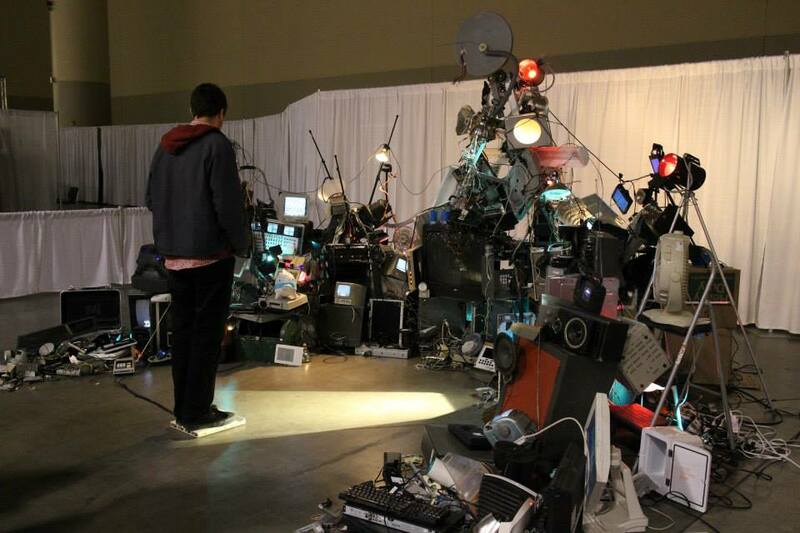 Researchers from every field of science participate in these events and are able to show and discuss their work with the public. 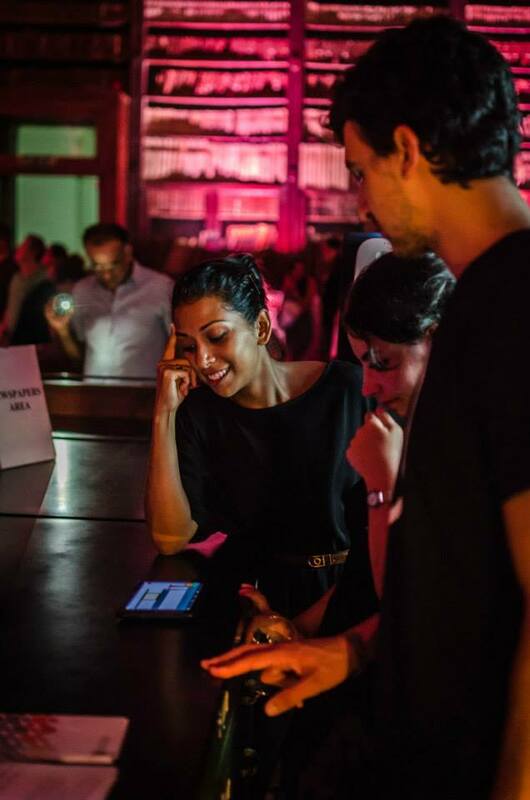 The NTUA team participated in the Researchers' Night Athens event to promote the iLearnRW software. The team took part in both the main event as well as a pre-event two weeks beforehand. The UoM team organised an exhibition for the event in Malta, which formed part of the Science in the City festival. During this festival, which this year attracted over 20,000 people, researchers take over the Maltese capital city to share their work with the public. 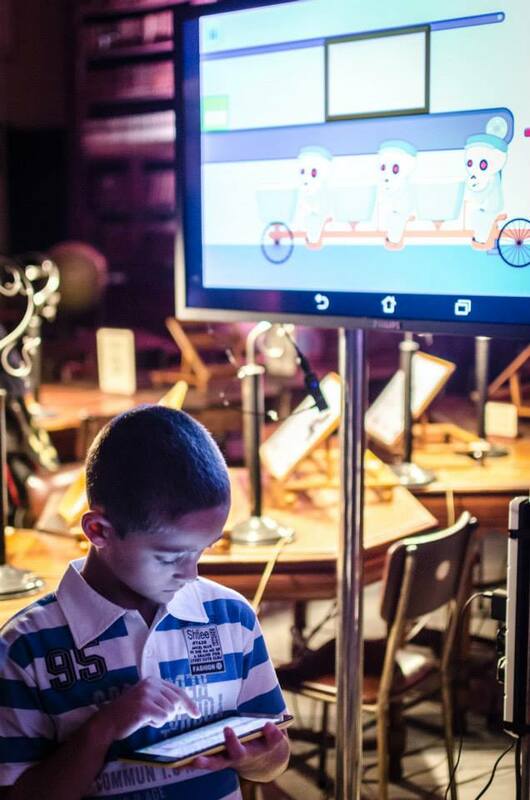 The UoM presented their work as part of an exhibition about digital games hosted at the national library. 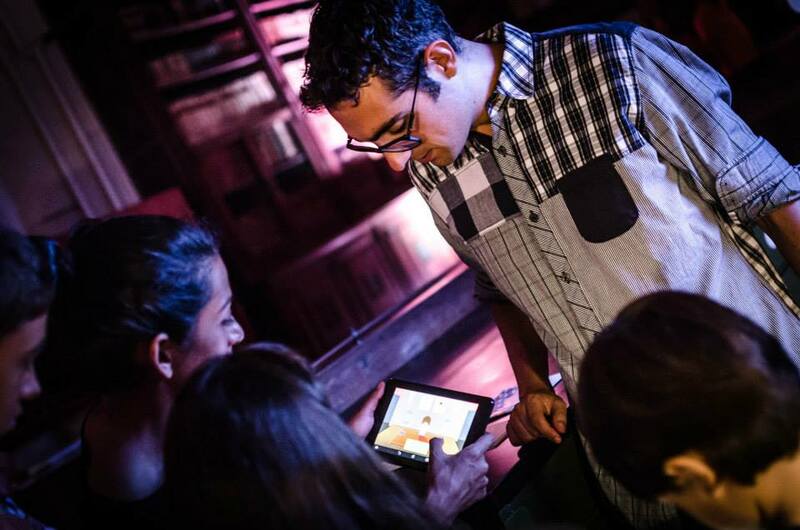 At both events people of all ages had the opportunity to try out the iLearnRW serious game and the reader, as well as to discuss with the researchers about neurodiversity, game design, learning and artificial intelligence. The Dyslexic Teens' Dialog (DTD) group and the Institute of Digital Games are joining forces to raise awareness and reduce the difficulties that students with dyslexia face in Malta. On our first event together, the young people from DTD tested the iLearnRW game and discussed with team members from the University of Malta about how to improve the current prototype. 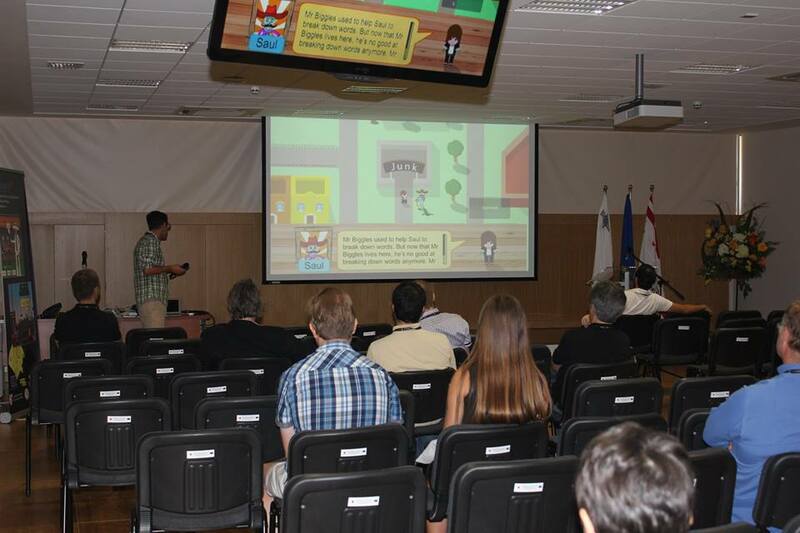 Héctor P. Martínez and Georgios N. Yannakakis (UoM) represented the iLearnRW project at the Conference on Virtual Worlds and Games for Serious Applications (VS-Games 2014). This conference explores multiple topics around the design and development of serious games for any application. 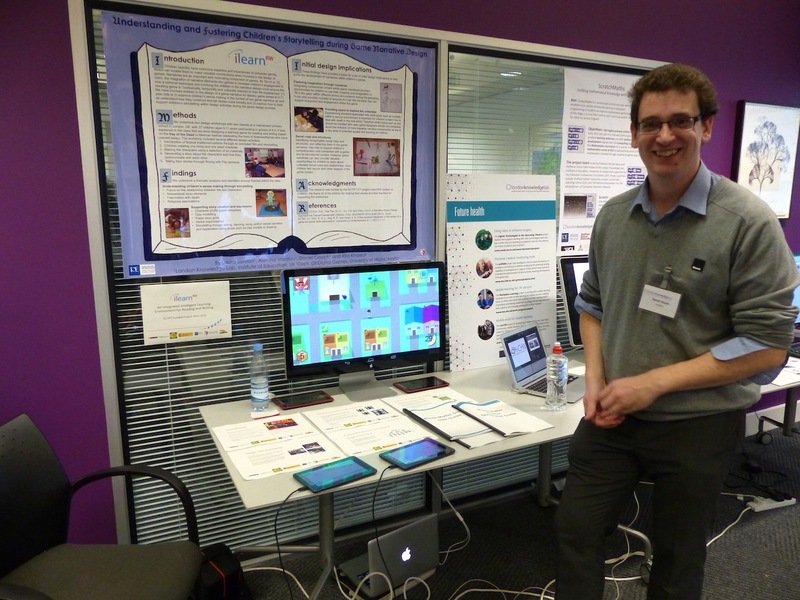 The UoM team demonstrated the iLearnRW game and talked about the technology and design behind it. 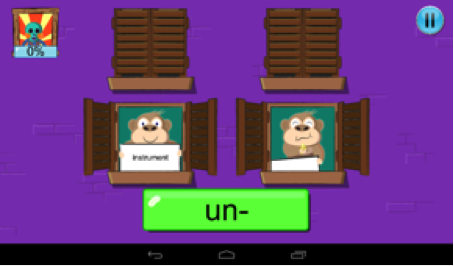 We now have initial versions of nearly all the games that will be included in the iLearnRW software and we have been showing them to children and teachers to get their feedback to help improve the final version. We have conducted several different play tests in three countries, including Greece, Malta and the UK, which has provided us with invaluable feedback about the usability of our software and also how appropriate it is for dyslexic users. 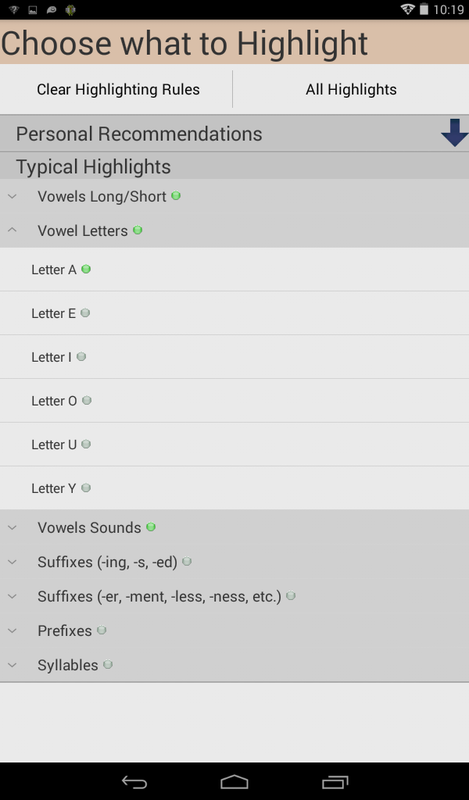 We have now consolidated all of the findings from the three countries which include the need to increase the font sizes, provide more visual game instructions, adjust difficulty levels of games and add in additional features such as character customisation. The development team are now working hard to integrate everything and ensure the final version of the software ready to go for our school evaluations in September. Mina Vasalou (IoE) was at the Interaction Design for Children conference (IDC) in Aarhus this month. The papers presented covered a span of ages from preschoolers to teenagers. 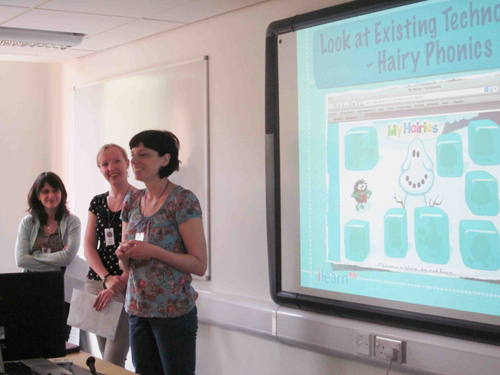 The conference had a strong design research thread but equally a lot of presentations explored children's use of technologies. 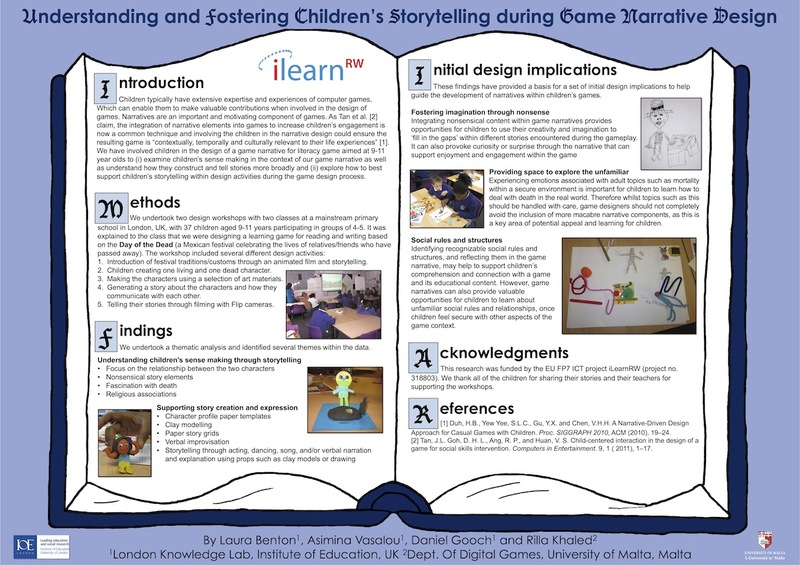 Mina presented a short paper from the iLearnRW project, which reported early results on a Participatory Design method for supporting children's storytelling. It also discussed the ideas that children proposed to inform the storytelling component of the game we are developing. It was encouraging to see lots of other researchers at the conference using similar approaches to involving children in the design of new technologies. This can support them to become more fluent in technology design, giving them the opportunity to influence decisions that will effect them. New Publication - Bridging Serious Games and Participatory Design (International Journal of Child-computer Interaction). Our work on participatory design for game design has been published in the International Journal of Child-computer Interaction. 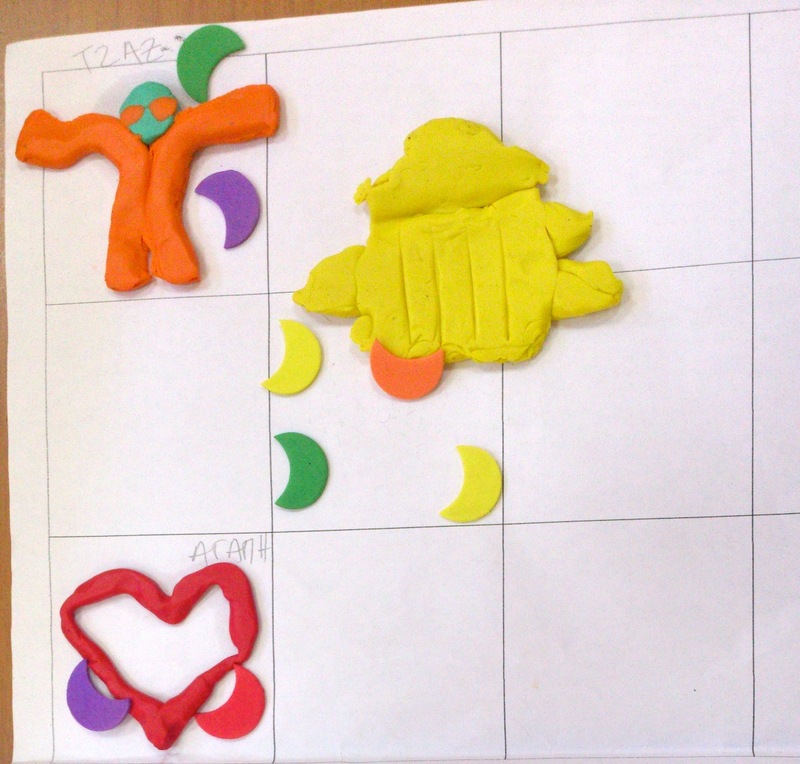 We have experimented with different ways of involving children in the design of learning games. 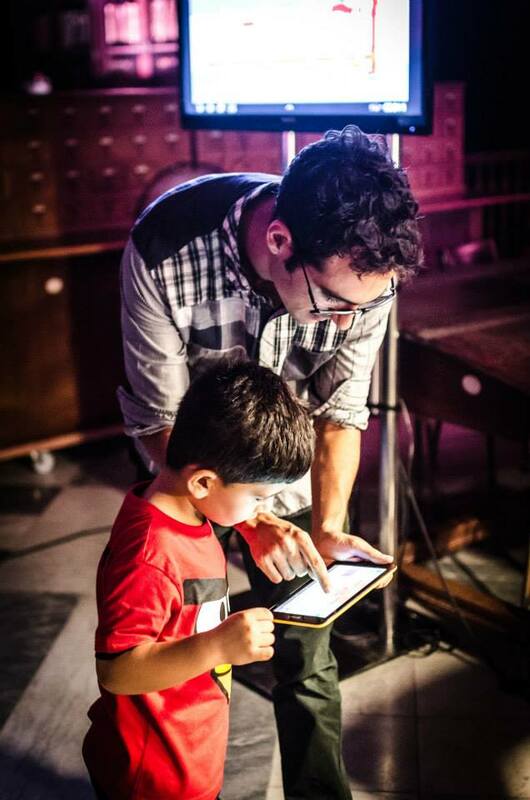 One of the biggest challenges we faced was children’s lack of domain expertise. While this might be overcome in some cases by training children through a long-term involvement, in our project we did not have longstanding relationships with schools that would allow for this to happen. This meant that children were involved in a one-off session. In our paper we describe the importance of developing participatory design methods that will support children’s idea generation by including the domain expertise within the activity. 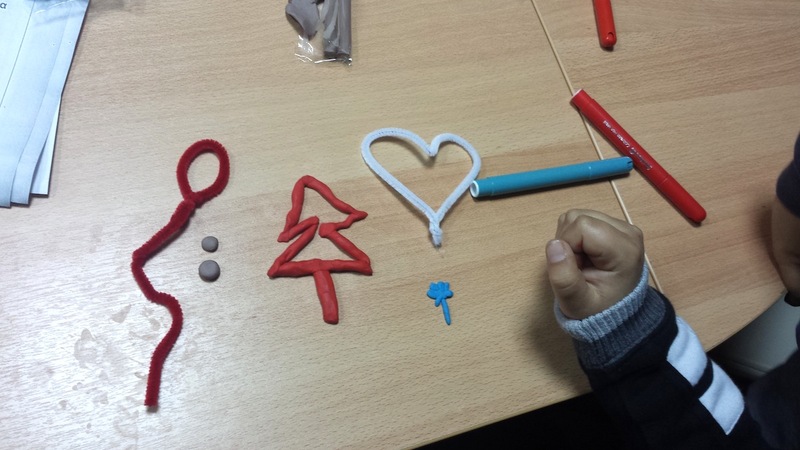 The paper reflects on the different skills that children brought to this type of workshop, which led to novel but different types of contributions. Within projects where there isn't time to train the participants, our research highlighted the importance of recruiting participants who possess expertise in the subject matter or in the technology domain. 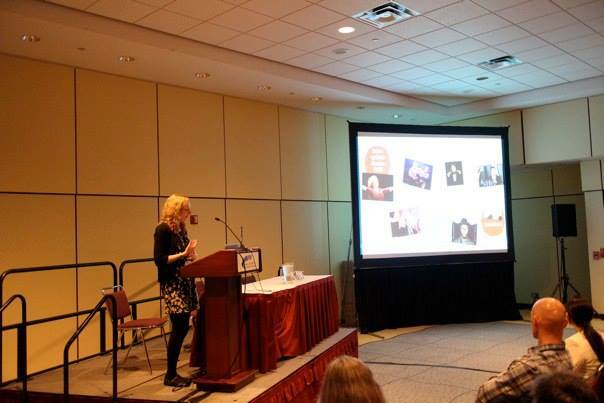 Laura Benton from the IoE team traveled to Toronto this month to represent the iLearnRW project at the largest global Human-Computer Interaction conference, CHI 2014. She attended a workshop on participatory design for people with cognitive and sensory impairments and discussed some of the design approaches used on the iLearnRW project with researchers who were working with individuals with a wide range of different conditions from autism and ADHD to visual impairments and dementia. She also presented her accepted paper Diversity for Design: A Framework for Involving Neurodiverse Children in the Technology Design Process and received positive feedback from other researchers who attended the presentation. 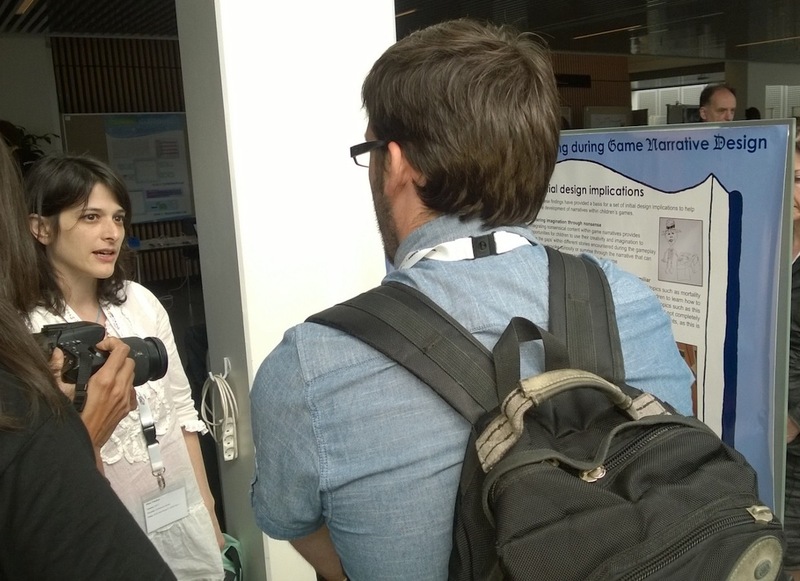 The conference provided a great opportunity to find out more about the latest HCI research around the world as well as make connections with researchers working in similar areas. The University of Malta team have recruited a new game artist to design the artwork as well as the audio for the iLearnRW game. We are excited that Dr Thomas Cushieri has now joined our project, a game artist, audio designer and lecturer with an interest in the educational applications of video games. He has already been hard at work - examples of some of the game artwork he has designed so far can be seen below. Building on the art workshops that we conducted in the UK, we undertook similar activities in Greece to better understand the children’s point of view about our game concept. This workshop involved with 27 children with specific learning disabilities, 9-11 years old, in several schools in the cities of Ioannina and Igoumenitsa. A fundamental purpose of this workshop was for the children to get involved in situations of feeling related to our game context, exploring the concepts of loss and bereavement. Thus, we described the whole scenario, we gave a lot of information about the traditions and customs of the Day of the Dead and, using art materials, we asked them to imagine or talk about possible experiences that they may have lived and to create their own characters and offers and attribute ways with which the living and dead could communicate. We now intend to use the outcomes of this workshop, alongside the two UK workshops, to guide the development of our game characters and their stories. 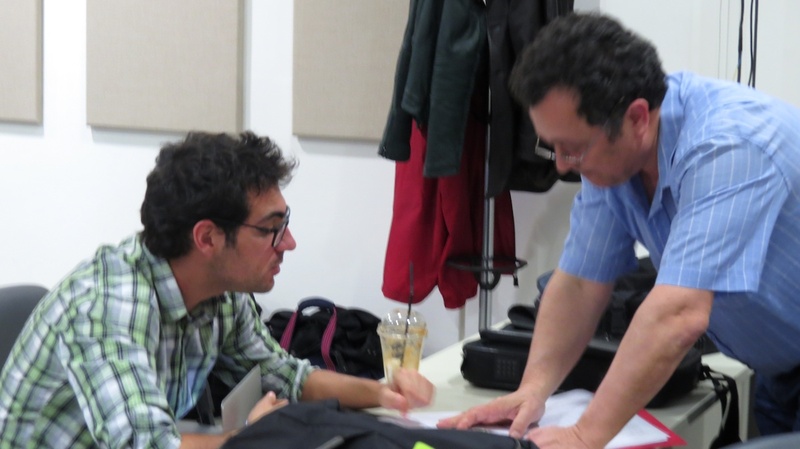 Partners of the project met in Athens this month. The key issue on our agenda was to prepare for our final year evaluation. There is lots to do before September. 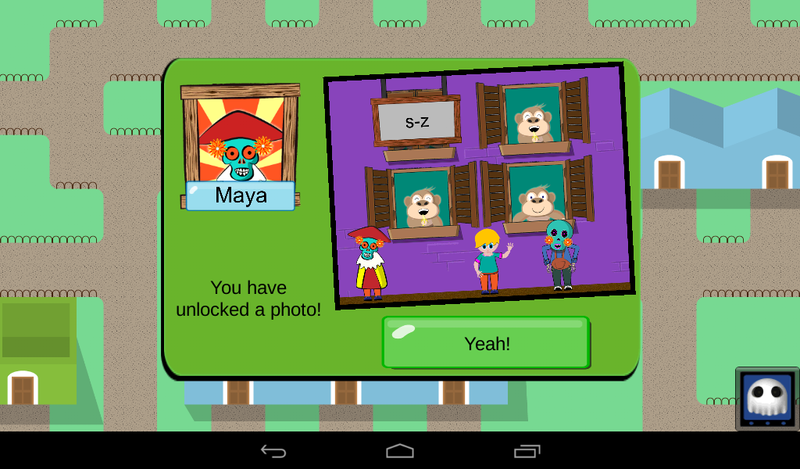 The developers are working to finalise the game and the reader. Our dyslexia experts will be providing feedback to designers along the way. Additionally it was decided that formative evaluations will take place in schools in Greece and England to inform the design and also pilot the evaluation methodology. More focused team meetings will take place between evaluation and development teams to ensure we are on track for September. Also, researchers at the IOE were excited to hear that their arts workshop was performed in Greece with children with dyslexia. Besides using the workshop as a platform for generating game narrative ideas, the theme of death and acceptance, as used in the workshop, supported children to express identity issues fostering more acceptance of their condition. Daniel Gooch from the IoE team was invited to the University of Bath to give a guest lecture on software engineering in the context of research. The main message of his lecture was that, in the context of research, software has a distinct purpose. Although software engineering projects typically have the development of new software as the primary goal, in research projects the software can also be a means of investigating a more interesting phenomenon. Drawing on multiple examples from the iLearnRW project, Daniel discussed how various aspects of the software engineering toolbox, including use cases/scenarios, requirements gathering, ethics, project management and scheduling, are adapted for developing software in research projects. In addition to promoting the project, the lecture also hopefully inspired some of the students to consider a career in research. 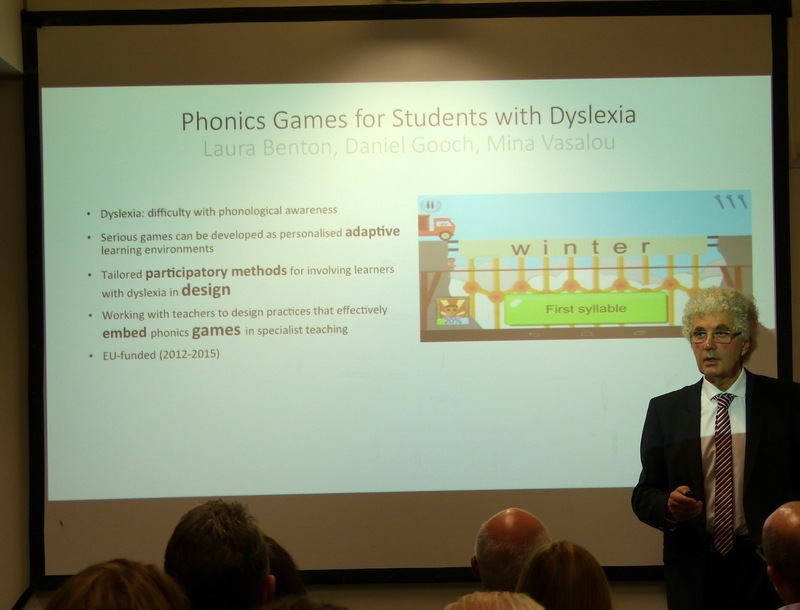 This month we had our first project meeting of the new year, which was organised by Dyslexia Action and took place in London. During the meeting the IOE team shared the results of the art workshops that had been undertaken in schools the previous week and a plan was agreed for running a similar set of workshops in Greece. The University of Malta team shared their plans for exhibiting the iLearnRW project at the Science in the City event taking place in Malta later this year, which will be a great opportunity for demonstrating some of our project achievements. We split into groups to discuss specific issues related to the content presentation and adaptation as well as the game design and development. 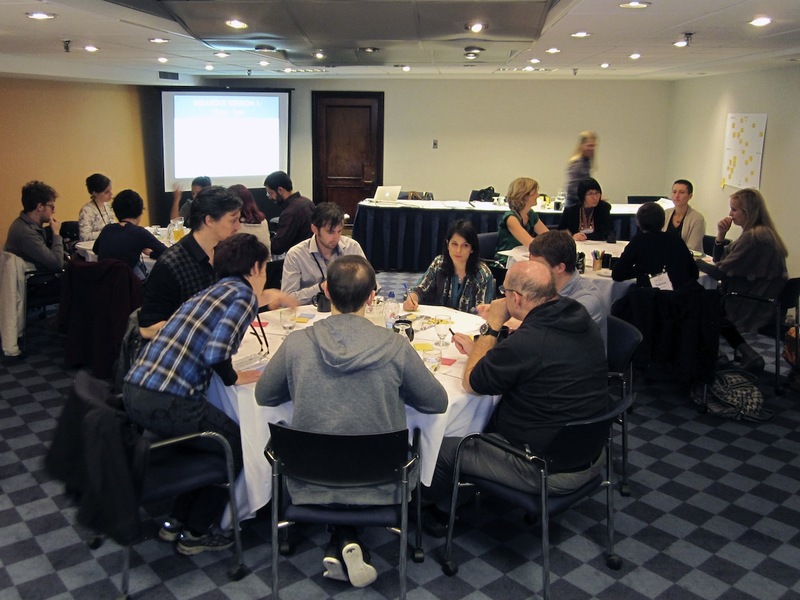 These smaller group discussions were very productive and many important decisions were made by the team as a result. The development of the system is now our key focus and we hope to have a working system later this year, ready to evaluate in schools in the autumn. 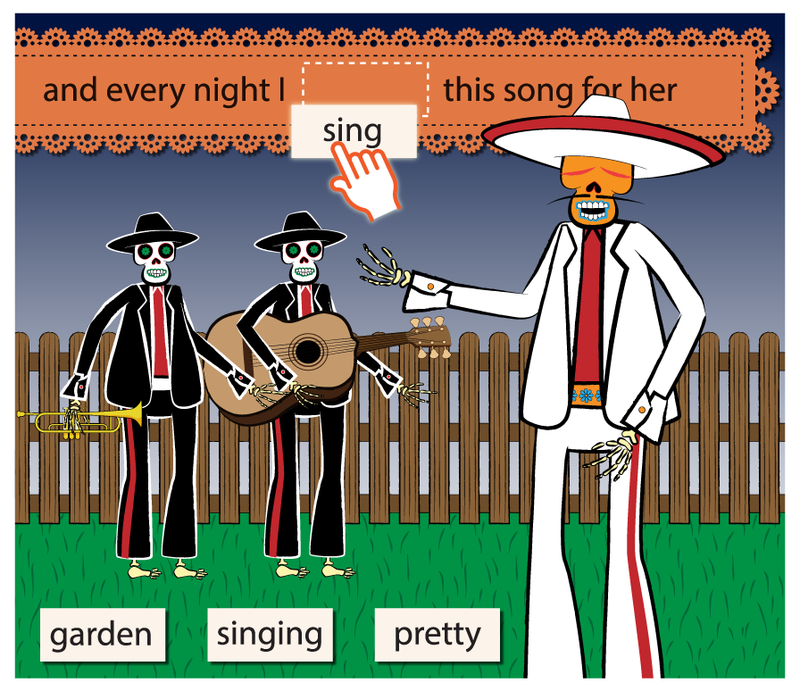 In order to explore our chosen iLearnRW game concept, which centres around the Mexican festival 'Dia de los Muertos' or in English the 'Day of the Dead', we ran several workshops with children in our target age group (9-11). The aim of these workshops was to get inspiration for our game narrative and also how the game could look, as well as to confirm if our chosen concept would be sufficiently appealing and engaging for children within this age group. During these workshops we taught the children learning all about the traditions and customs of the Day of the Dead. They then used art materials to create their own characters to tell a story about how the living and dead could communicate during the festival. The children also used Flip Cameras to film their story ideas so we could share them with our game design team in Malta. This month our project had it's first review meeting at the EU in Luxembourg. This was an opportunity for the members of the project to share the results of the last 12 months worth of work with the project officer and it's reviewers. Each of the presentations regarding the deliverables was well received with the reviewers being pleased with the quantity and quality of the work described. A few areas were raised as needing further consideration (including undertaking more participatory design work in Greece and building on our dissemination work) which were warmly received by the consortium. We look forward to continuing our work with the project reviewers to improve and evolve the work of the project. Paper accepted - Diversity for Design: A Framework for Involving Neurodiverse Children in the Technology Design Process. 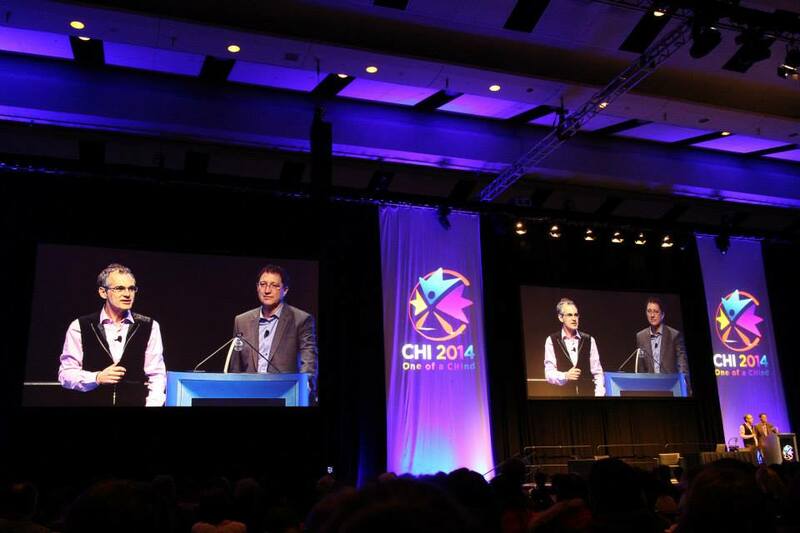 We have had a paper accepted into the 2014 ACM SIGCHI conference on Human Factors in Computer Systems, the premier international Human-Computer Interaction conference. Our paper describes the development of the Diversity for Design (D4D) framework, which provides guidance for technology designers working with neurodiverse children (including those with dyslexia) to enable them to capitalize on neurodiverse children's particular strengths, as well as support any potential difficulties. 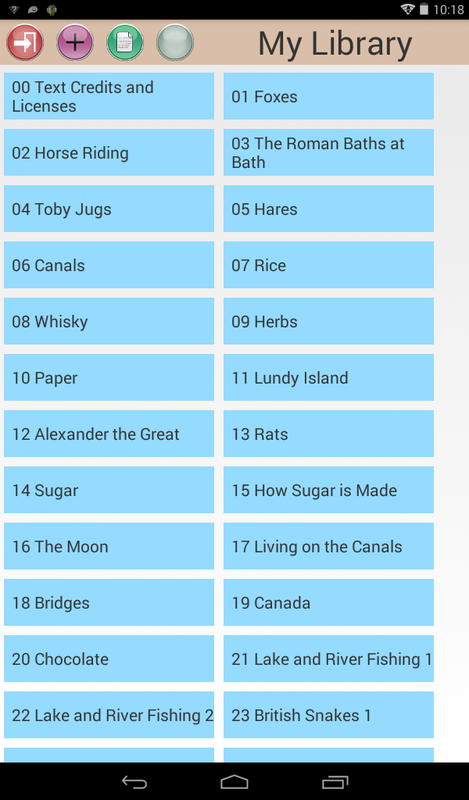 This work was informed by some of the design workshops that we undertook with UK school children earlier this year and will be presented at the SIGCHI conference which takes place in April 2014 in Toronto, Canada. A copy of the paper will be made available on the website soon. This month we had our project team meeting, which was hosted by Dolphin in the historic city of Worcester. We firstly reviewed the progress that had been made over the last year, with partners presenting overviews of the project deliverables submitted last month including the system and user requirements as well as an overview of the user model. During the meeting there were also some interesting discussions between the dyslexia experts and developers, which highlighted the complexities of the English language, particularly in comparison to Greek, and the challenges that lay ahead as we move into the implementation phase of the project. The University of Malta presented some of the great work they had done on the serious game and also demonstrated one of the mini-games they had implemented on a tablet computer. Overall it was a very productive meeting, with good progress made over our first year but with plenty more work to do during the next two years of the project. We have had a paper accepted into the responsible research innovation observatory, which aims to build a collection of case studies reflecting a range of ethical issues and dilemmas when conducting ICT research. Within the iLearnRW we are keen to consider the ethical implications of the research we undertake and ensure it is conducted in a responsible way. Our paper describes some of the challenges of doing this within a geographically diverse and multi-disciplinary team such as ours. The University of Birmingham team have moved institutions, and are now based at the London Knowledge Lab, which is part of the Institute of Education in Bloomsbury, London. This provides us with an exciting opportunity to share and discuss our work on iLearnRW with some of the leading researchers in the educational technology field. The iLearnRW project was presented at the 29th World Congress of the International Association of Logopedics and Phoniatrics at Torino, Italy, August 25-29, 2013. The paper "A new software Integrated Intelligent Learning Environment for Reading and Writing (iLearnRW) in Dyslexia: Theoretical Principles and Main Objectives" coauthored by E. Mitropoulou, V. Zakopoulou and A. Symvonis was presented on Tuesday 27 August 2013 and is included in the Abstracts Book of the Congress. 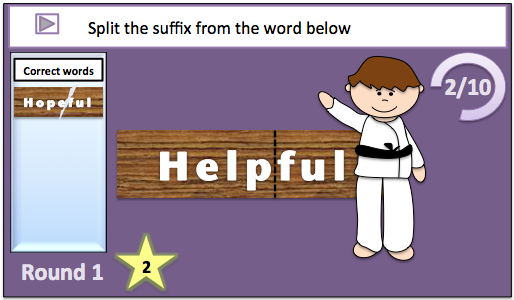 A 2 day workshop took place the Dyslexia Action head office in Egham, Surrey, which aimed to refine the design of the reader app within the iLearnRW software. 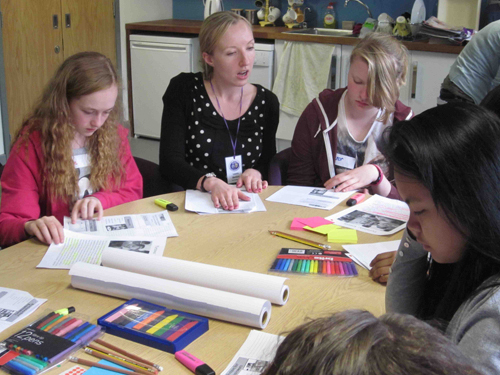 Project members from the University of Birmingham and Dyslexia Action participated within the workshop. A review of existing tablet-based applications was undertaken by one of the dyslexia experts on the project prior to the workshop. 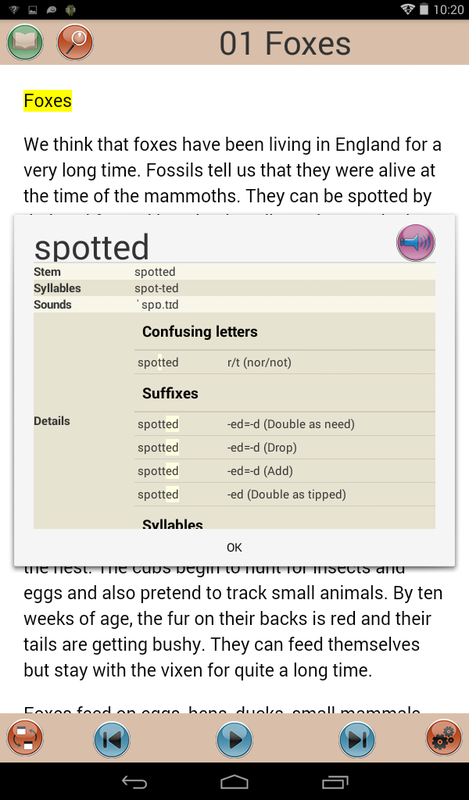 The findings from this review were discussed during the meeting and used to inform the development of a series of mock-ups of the iLearnRW reader screen design. Project team members from the University of Birmingham and Dyslexia Action collaborated on a project dissemination event at the Dyslexia Action London centre. We organised a day aimed at children attending Dyslexia Action classes (from any DA centre) that aim to give them the experience of being a game designer and tester. Several different tablet computers were provided to the children who attended to test out a range of different existing literacy games, the children were also invited to bring their own tablets with them to show us the games they like to play at home. The children additionally participated in a game design activity, where they were presented with some of the existing iLearnRW activity ideas and given the opportunity to incoporate their own ideas for how the games could best provide feedback and reward the player for doing well. A fun day was had by all and the children were thanked for taking part with prizes and certificates. 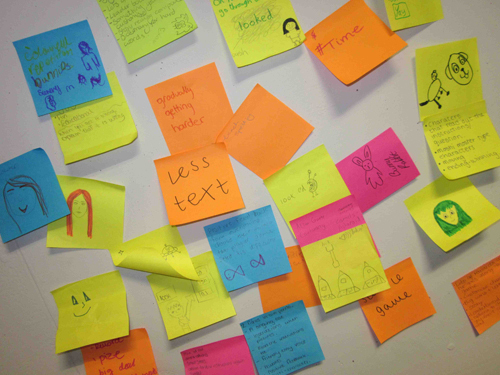 We ran a series of design workshops at a London primary school with a group of four children aged 9-10 to further inform specific elements of the game design. These workshops were designed to be fun and engaging for the children in addition to informing the project, with lots of different creative activities including Lego team building games, iPad games testing, group discussions as well as drawing out lots of different game ideas. The workshops were specifically focused on generating and developing ideas for the game navigation as well as how to support and give feedback on specific literacy difficulties the children may experience during the game. Members of the iLearnRW project took part in the #define Diversity in Computing festival at Rugby school, which incorporated a day of talks and workshops for students aged 11-13. The aim of the event was to encourage and inspire students who would not normally consider a career in Computing. 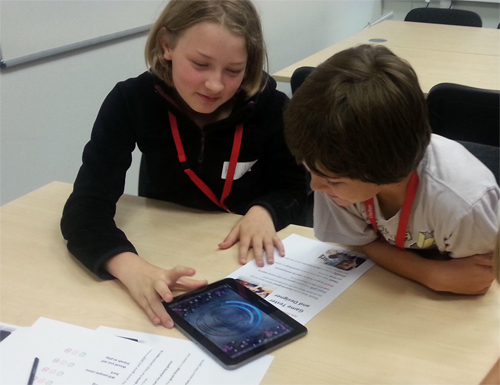 A number of project team members from the University of Birmingham ran a workshop for students to teach them about Human-Computer Interaction (HCI) in learning games. The students learned about the different methods we have used on the iLearnRW project which include evaluating existing technology, observations and interviews with teachers, parents and children as well as developing personas. The students then had the opportunity to come up with their own ideas for games that could help children with dyslexia. They thought about the particular difficulties the children might have and how these difficulties could be supported within a game. Then using arts and craft materials they worked in teams to draw out their game idea. 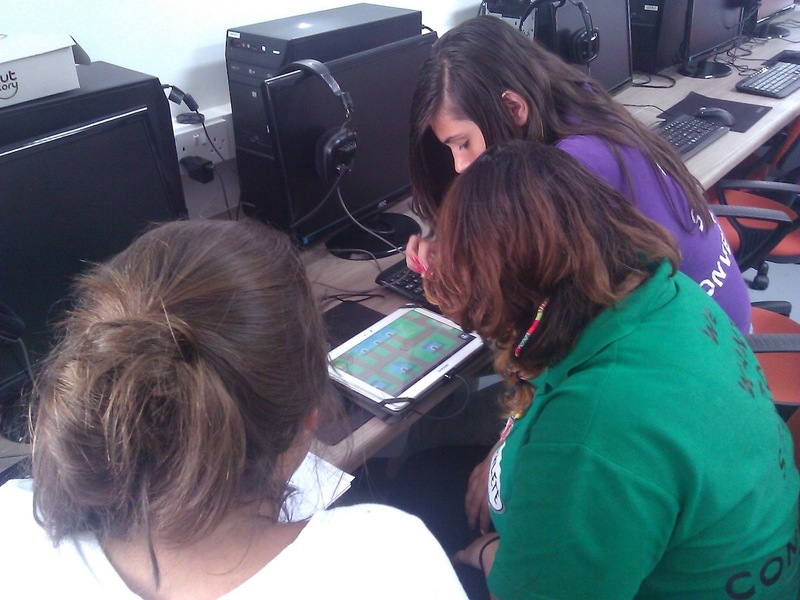 At the end of the workshop the students had the opportunity to share their final game with the rest of the group. Lots of fun was had by all and the students came up with some fantastic ideas for games, which will help to inspire us as we start to design the activities and games that will be incorporated into the iLearnRW system. Project team members from the University of Birmingham and Dyslexia Action undertook a 2 day workshop at the University of Birmingham to produce the initial designs of the learning activities that will be incorporated into the iLearnRW software. The findings from the workshop with Dyslexia Action teachers were used to identify the key literacy difficulties that the activities should focus on. Each activity was designed to be fun and motivating for children with dyslexia to encourage them to practice areas of specific difficulty. Mock-up interface designs (below) were then produced for each of the activities to show how they might look and these mock-ups were taken into schools to get feedback from specialist teachers. Project team members from the University of Birmingham and Dyslexia Action conducted a focus group with 5 experienced Dyslexia Action teachers (and 1 Dyslexia Action teacher-trainer) to find out about the types of problems their students have. The teachers described the problems they see most often and those linguistic difficulties they consider to be most important to address. This information was very important in starting to create the User Model for the iLearnRW project. Project team members from the University of Birmingham and University of Malta conducted a number of focus groups with children within our target age group (9-11) in two London schools to find out about the types of computer games they prefer to play and also to get their feedback back on our initial ideas for the iLearnRW serious game. The children described their favourite games to us and what makes them want to keep playing them as well as the devices they prefer to play these on. We then showed them pictures and videos of several existing computer games for their age group and they told us what they thought of the game design and concepts. 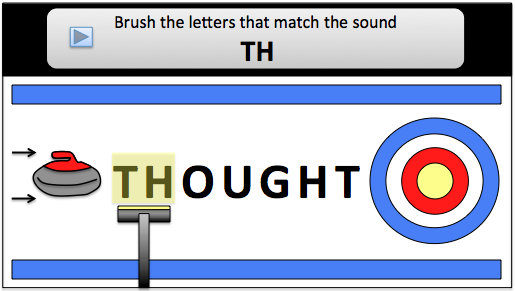 We then presented a number of different concepts for the iLearnRW game and the children then shared their thoughts on these as well as their own ideas. The sessions were really useful for us to find out what sorts of games are appealing to children of this age group and we were amazed by the amount and range of different game playing technologies that the children had access to and were confident in using. The children were extremely enthusiastic in sharing their ideas and opinions with us, and the findings from these sessions will be useful in progressing our game concept further.